Premium Folding Chair with High-Pressure Tablet Armfrom National Public Seating Corp.
We took our best selling series 200 folding chair and we added a folding tablet arm writing surface. 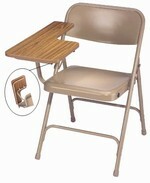 Fold the chair and the Tablet folds up against the chair and can be stored compactly. Tablets are 5/8" thick Particleboard with a high pressure Wilsonart laminate. In stock in either left or right handed in Beige with a Banister Oak top or Grey with a Grey top. Tablet: 11 1/4 X 22"
Frames are electrically seam welded 18 gauge 7/8" tubular steel. Cross supports are 5/8" 18 gauge steel tubing. 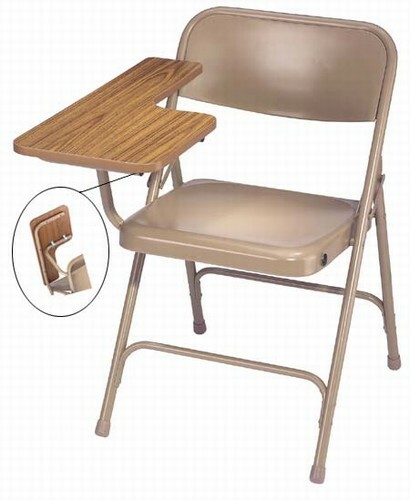 Seats and backs are 20 Gauge steel with full curled safety edge. Tablet is 5/8" thick Particleboard with a high pressure laminate. Tablet understructure is a double arm 7/8" tubular frame. Leg glides are replaceable non-marring polyethylene.